This isn't just the latest fad in a DIY-crazed nation. Underfloor heating is stylish, practical and affordable. Whether you want to go for the stylish and sleek look of a room without radiators, or have decided to maximise the use of a conservatory or summer house, there has never been a better time to take advantage of cost effecient, underfloor heating. All underfloor heating systems work on the same basic premise - hot water moves under the flooring. This hot water emits heat by convection. 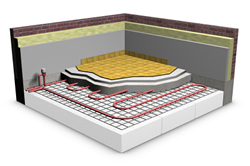 Underfloor heating includes two main components: the tubing, which is placed beneath the floors of your home, and a heating source – a water heater or boiler. While conventional heating systems rely on air circulation to distribute heat, underfloor heating makes the most of warm air, which rises, to provide comfortable, wrap-around warmth in homes, conservatories and even garages. Installed beneath a home’s floors, it radiates heat upward and outward, spreading warmth and comfort with greater efficiency throughout the room in which it is installed. Almost any home can be equipped with underfloor heating. 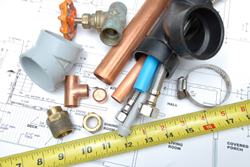 Installing systems in new homes or conservatories at the time of construction is generally easier and less expensive, but most remodeling projects in your home can be designed to accommodate underfloor heating. Tubing can even be put down during construction, with the full system completed later. There's no easy answer to this but 'Not as much as you might think!' should do it. Projects can start from £2,000 and obviously keep going. Unfortunately there is no magic formula. But, dependant on the location, and also my availablity I will come and do a free visit and estimate. I guarantee that within 7 days of the visit I will have completed and sent on a full valuation. Any prices will come inclusive of the design service and fitting. You're not just buying a flat pack kit. To find out a little more about what we do click an option above, otherwise why not contact us.